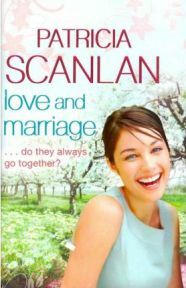 I’ve always been a fan of Patricia Scanlan who is another of my favourite Irish writers. A couple of years ago I read and loved one of her books, ‘Forgive and Forget’, and was delighted to discover that it was the first book in a trilogy. I have subsequently read the second book, ‘Happy Ever After?’ and have recently really enjoyed the third and final offering, ‘Love and Marriage‘. In this book, I was able to reacquaint myself with all of the characters that I have come to know and love and to find out whether they really do live happily ever after! Although this ‘Love and Marriage‘ would be very enjoyable as a stand alone read, I think that you would enjoy it more if you have read the other two books in the trilogy first.